Regular cleaning schedule does provide you a temporary clean premise but there are always certain corners that remain unclean even if you try hard to keep the apartment clean. When the grime and germs grow higher to an intolerable level, getting a deep Cleaning service becomes essential otherwise you’ll end up confronting the diseases and unpleasant environment at your apartment. 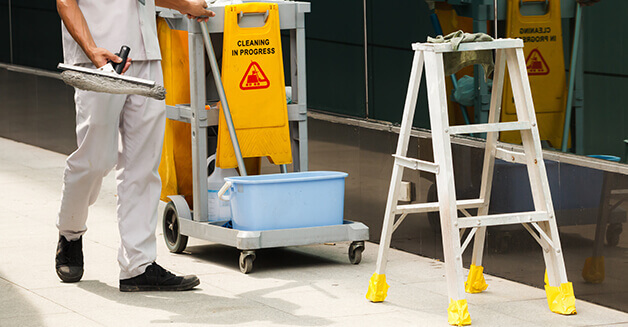 To help you make the wise decision whether to stick with a regular cleaning schedule or hire the deep Cleaning Services in Dubai, we jotted down few operations that a deep cleaning service provider would offer you. So read along and discover what a deep cleaning service can do for making your apartment neat and spotless again. As the majority of UAE residents use cylinders in the kitchen area so they are well aware of the stains that these cylinders leave behind on the floor. The problem starts to look big when you change cylinder’s location and find a circle imprinted on your floor from the bottom of the cylinder. This kind of stain is not very easy to be removed using conventional methods and require specialized cleaning service. We usually include steam cleaning service when a customer asks us to schedule a deep cleaning service session for problems like this. The steam cleaning process successfully removes the sturdy stain of the cylinder that is making the floor look rusty and old. If you keep the big part of your floor open instead of covering it with a carpet or rug, you need to change your cleaning approaches. The usual mopping activity would remove the visible sand from your floor but it fails to eliminate the unseen germs from your floor. The problem becomes even worse when you have toddlers in the house that crawl around the place on the naked floor. Our deep cleaning services include smart cleaning approaches and proven cleaning products to deal with these unseen and dangerous germs that are making your floor contaminated. Have you noticed that the commode that you use plenty of time during the day has lost its shine? Commode, bathtubs and other items in your washroom are bound to get old and adopt problems of such nature. And these problems are not usually resolved using conventional cleaning methods as they require thorough cleaning session that only a deep cleaning service can provide them. Our cleaning experts are specifically trained to handle all your stain related problems including toilet and bathing area items. You might be keeping the place nice, clean and tidy but there are certain elements that get out of hand and become messy. And in these elements the glass based items top the list in which the bathroom mirror and windows top the list. It happens due to the dampness in the atmosphere as you go about using shower or sink tab but these things can be restored if not too late. We help you restore the shine of your glass based items using our deep cleaning service solutions. In a household premise, there are plenty of items that get dirty and the marks stick to their surface. We’ve designed our deep cleaning services in a way that they can be used to remove the stubborn marks from any surface without ruining the natural beautify of that item. So if you’re looking for deep cleaning services to restore the furniture, fix the floor issues or for any type of stubborn marks, you know what service to ask for. You may speak with one of our key account managers on 0800 25326464 to discuss about your deep cleaning service needs. Call now and get free price estimations along with flexible service booking. cleaning Servicescleaning services dubaiCleaning Services in Dubai .